Branson’s Murder Mystery Dinner Show is one of the most unique dinner shows in Branson where some of the audiences can join the fun. 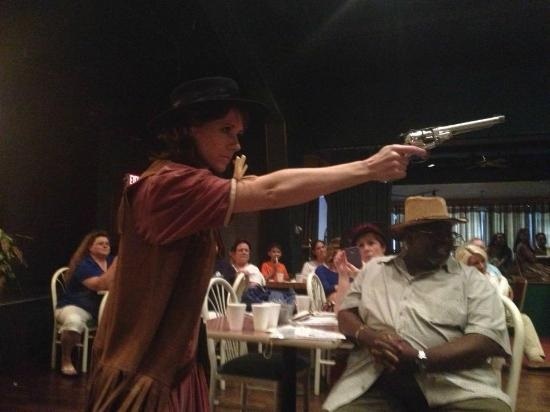 The presentation of “Murder on the 76 Trail” at the Branson Murder Mystery Dinner Theater is Branson’s interactive and fun-filled dinner show. This murder mystery show features hysterical, slightly silly, and downright zany theater plays that you can watch right before your eyes. With a bunch of 15 extremely talented cast, and taking the role of different characters in this surprising production, this show interacts directly to the audience members at their tables. It’s interactive all throughout, no kidding about it. Just imagine of the role you can play, you could be Missouri’s favorite outlaw, Jesse James; or maybe his brother, Frank James. Some of the lady audiences, can play the role of one of the feisty ladies of the Old West, and maybe some of you can be Calamity Jane or the famous “Annie Get Your Gun’ Oakley.” An exciting show to watch and it’s gonna be a blast, too. The story of Branson’s Murder Mystery is about the bygone era of the Old West that happened in the Midwest. Some of the good folks of Branson were dying mysteriously. Nobody can tell what’s really happening but it was told that the insanity begins when lives start ending. As the story unfolds, there’ll be guns shootin’ – trains honkin’ – and many people runnin’ around and yellin’ … such a grand time. And if you get caught, they’ll strap a six shooter on you (not a real gun of course), they’ll slap you with a cowboy hat over your head and enlist you to help solve the murder mystery. This whole darn story is loosely based on real Branson history. Before the show starts, you will be treated to a mouthwatering meal so that crime fighting and mystery solving can be more fun. If you are craving for delicious treat, this is your time to sink your teeth into tasty smoked pulled pork, southwestern chicken, roasted potatoes, green beans, macaroni and cheese, salad, dinner rolls, and lemonade and tea. After the feast, you will be transported back to the old west, Branson Murder Mystery Dinner Show will plunge you right into the center of a murder mystery. As the show begins, you’ll be dumbfounded with the presentation “Murder on the 76 Trail”. You will be seeing innocent residents of Branson start to fall like flies, and the authority is looking for help to bring the culprit to justice. Fifteen characters will be taken from the audience to participate in the show. The audience members are placed right into the mix of the mystery, and it’s their job to solve the case. The participants are given a character to play and their mission is to find the suspicious character and help solve the mystery to save the city.